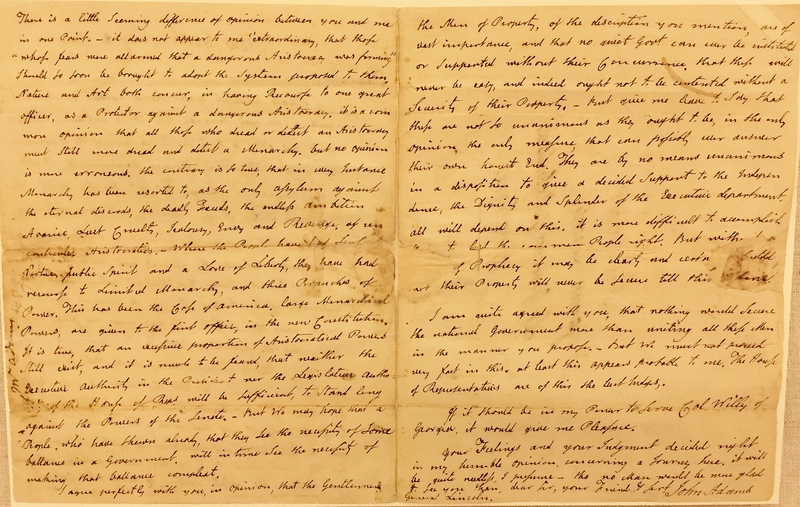 Now on view in the Reading Room of the Patricia Klingenstein Library: Inventing the American Presidency. This exhibition is being presented as a part of the Society’s Presidency Project. As the executive office has evolved, its powers have expanded considerably. 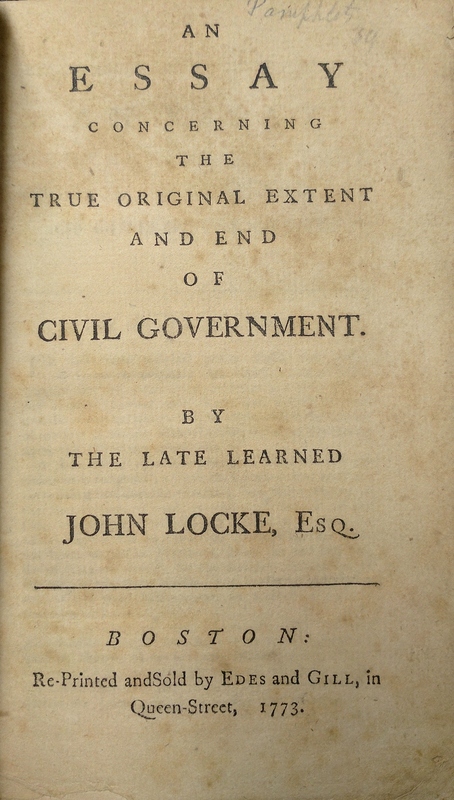 Among the most contested, “executive prerogative” derives from the political philosophy of John Locke, though it does not explicitly appear in the Constitution. 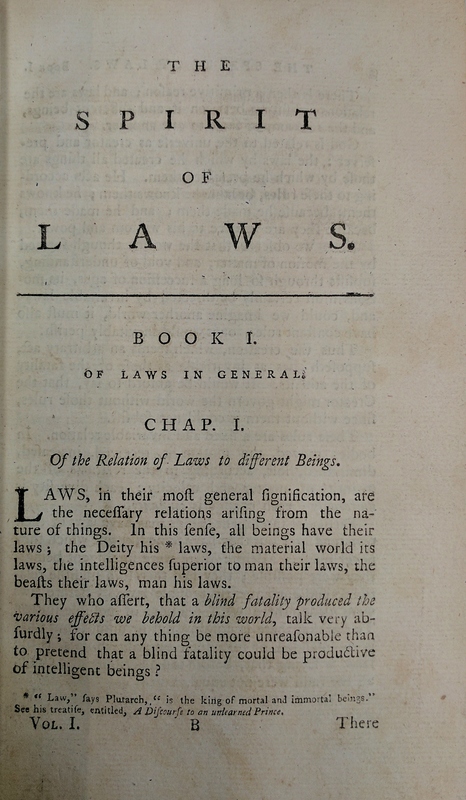 Locke’s concept gives discretionary, extra-legal power to the executive in exceptional circumstances, and originated in his Two Treatises of Government (1689). On the eve of revolution this edition of the second treatise, which includes his theory, appeared in Boston. It is the frequent references the framers made to Locke which underpin the argument that this special power is implied in the Constitution, if not specifically expressed. One of the powers the Constitution grants to the president is the appointment of executive officers. As adviser to George Washington and Chancellor of New York, Robert R. Livingston had hoped to secure a position in Washington’s government, eliciting this candid response from the newly inaugurated president. 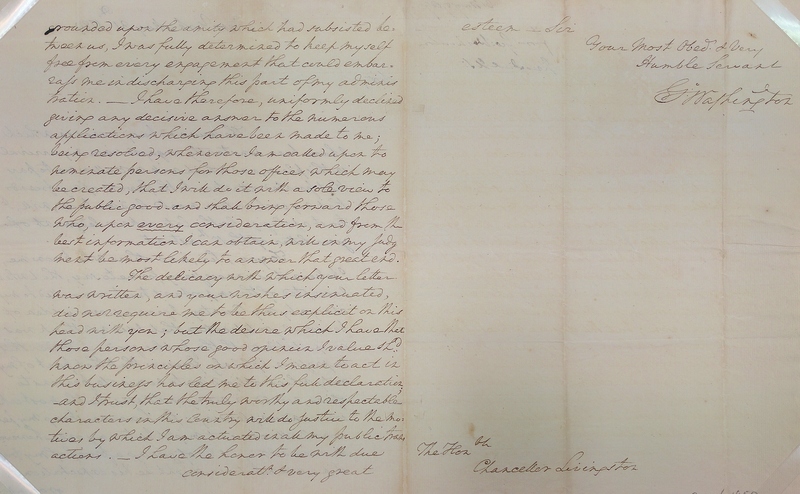 In it, Washington stresses his devotion to the “public good,” and his desire to remain “free from every engagement that could embarrass me in discharging this part of my administration.” Whatever his “personal attachment,” Washington was keenly aware that his use, or abuse, of executive powers would shape the office under his successors. The Constitution’s separation of federal powers among three branches, including an independent executive, offered a practical solution to the ineffectiveness of Congress under the previous Articles of Confederation. It was Baron de Montesquieu, the most cited Enlightenment political theorist during the convention, who proposed separating political powers into independent legislative, judicial and executive branches in his treatise De l’Esprit des Lois (The Spirit of the Laws), first published in 1748. This copy of his Complete Works includes the treatise and is from the personal library of founding father Robert R. Livingston. 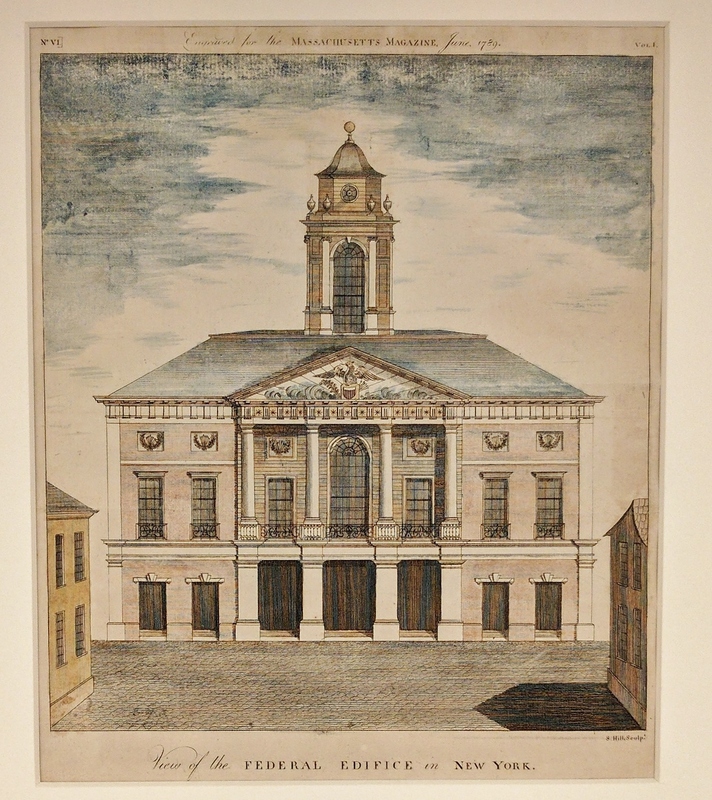 On April 30, 1789, George Washington took the oath of office as America’s first president at Federal Hall, the short-lived seat of the federal government in New York. 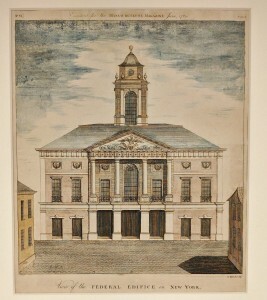 This plate accompanied a Massachusetts Magazine piece describing the building, formerly City Hall, and recently adapted to accommodate the First Congress. With President George Washington barely a week into his first term, John Adams highlights the importance of the executive “as a Protector against a dangerous Aristocracy” still present in the legislature. He also counters the assumption that monarchy bears the greatest threat to the fledgling government. Instead, he acknowledges the “large Monarchial [sic] powers” that the founders reserved for the executive to strike a balance with the legislature. 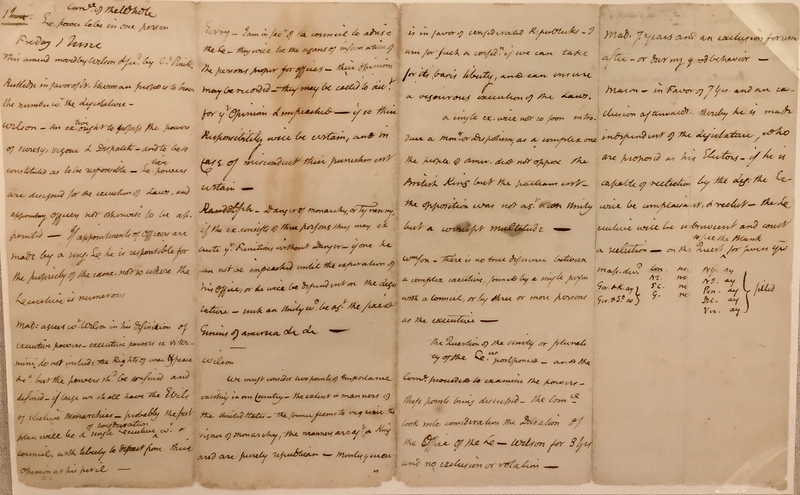 In this rare glimpse onto the drafting of the Constitution, Massachusetts delegate Rufus King records the debate over the nature of the executive office. James Wilson, of Pennsylvania, argues against a plural executive and emphasizes the importance of “vigour” in that office. In defending such a powerful executive, he offers that “The people of [America] did not oppose the British King but the parliament – the opposition was not [against] a unity but a corrupt multitude.” The resulting “presidential democracy,” defined by its strong, independent executive, is perhaps America’s most enduring contribution to modern republics.